PORTLAND, Ore., Jan 14, 2015 (BUSINESS WIRE) — Erickson IncorporatedEAC, -2.66% a leading global provider of aviation services, announced today that the company will expand its relationship with HRT Participações em Petróleo, S.A. (“HRT”) with a two-year contract beginning Q1 2015. This signing furthers the partnership between HRT and Erickson and demonstrates Erickson’s strong market position in the South American oil and gas industry. 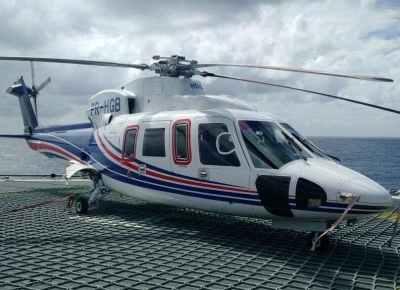 Two Sikorsky S-76C+ helicopters will be used to transport HRT’s personnel to their off-shore rig 60 miles from Rio de Janeiro. Brazil is expected to lead the global growth of the oil and gas market over the next several years and is anticipated to see the highest increase in ranking of the world’s oil reserves between now and 2020. Air Amazonia has been HRT’s trusted aerial service provider since 2011, and Erickson has a reputation of expertise, strong past performance and safety. This combination of attributes reinforces the company’s growing reputation within the South American oil and gas Industry. Erickson’s extensive portfolio of successful and safe passenger transport and heavy-lift projects across the globe speaks to its trusted brand and reputation. Erickson employs the world’s most qualified pilots and maintenance personnel essential to performing safe and reliable flight operations. Erickson is a leading global provider of aviation services for a diverse mix of commercial and government customers. Erickson currently operates a diverse fleet of 86 rotary-wing and fixed-wing aircraft, including 20 heavy-lift S-64 Aircranes. The Aircrane is the only helicopter in the world with an aft-facing pilot station used to control extreme precision load placement. This fleet supports a wide and worldwide variety of government and commercial customers, across a broad range of aerial services, including critical supply and logistics for deployed military forces, humanitarian relief, firefighting, timber harvesting, infrastructure construction, and crewing. Erickson also maintains a vertical manufacturing capability for the S-64 Aircrane, related components, and other aftermarket support and maintenance, repair, and overhaul services for the S-64 Aircrane and other aircrafts. Founded in 1971, Erickson is headquartered in Portland, Oregon, and maintains facilities and operations in North America, South America, Europe, the Middle East, Africa and Asia-Pacific. For more information, please visit www.ericksonaviation.com. This press release contains certain statements relating to future results (including, without limitation, “believe,” “may,” “estimate,” “continue,” “anticipate,” “intend,” “plan,” “expect,” “predict”), which are forward-looking statements as that term is defined in the Private Securities Litigation Reform Act of 1995. These forward-looking statements are based on beliefs of Company management, as well as assumptions and estimates based on information currently available to the Company, and are subject to certain risks and uncertainties that could cause actual results to differ materially from historical results or those anticipated, including our inability to successfully execute on our contract with HRT in Brazil and also including certain other risks or uncertainties more fully described under the heading “Risk Factors” in our most recently filed Annual Report on Form 10-K as well as in the other reports we file with the SEC from time to time, which are available at the SEC’s web site located at http://www.sec.gov. You should not place undue reliance on any forward-looking statements. The Company assumes no obligation to update any forward-looking statements to reflect events or circumstances after the date of such statements or to reflect the occurrence of anticipated or unanticipated events.